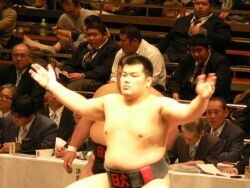 Masahiro Yamaguchi (Tottori Johoku High School), only 16 years old, is the 2005 High School Yokozuna. Since the legendary amateur wrestler Keita Kushima won this title 24 years ago (later he became a maegashira under the shikona of Kushimaumi), it's the first time that a rookie student is a winner. With his 1.80m and 135 kg, he dominated the giant Lee Dai Won (1.93 m, 165 kg !) in the final with an uwatedashinage. Hanada, Yoshida and Yamamoto (210 kg ! 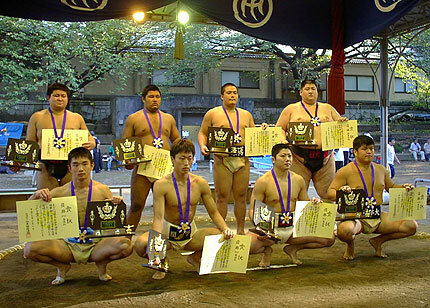 ), all from Nichidai, are the only defending champions who won another title this year. Tadao Ogasawara (Aoi Morio Mirai Sozo Foundation) dominated the clear favourite, Kouichi Kato, in the final and so became the 2005 Company Yokozuna, a title which can bring him to the rank of makushita tsukedashi, but Ogasawara is too old (27) to join ozumo. 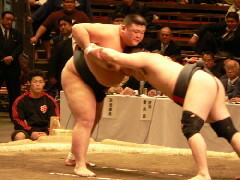 Yoshida and Ichihara won back-to-back titles after their successes in 2004, but Shimoda conceded a very surprising defeat against the German wrestler Torsten Schreiber in the all-categories contest. Teams: Japan wins with Yoshida, Ichihara and Shimoda. First major title of the year for Keisho Shimoda (1.75 m, 130 kg), which guarantees him the status of makushita tsukedashi if he decides to join ozumo. So Shimoda becomes the 2005 College Yokozuna. Yet his final success against his teammate from Nichidai was a bit disappointing, as he used a henka to beat Mori. So Yoshida becomes the 2005 Amateur Yokozuna, which enables him to start with a makushita tsukedashi status if he decides to join ozumo. Yamaguchi: This young High School wrestler already has very solid physical skills and an exceptional technique. Moreover, he works hard and learns quickly. Probably a future great member of ozumo. Mori: Certainly the best college wrestler of the last two years, not only did he face many injuries (especially right knee injuries)... but also Shimoda's henka in the final of the college championships. He will have to use his last college year to finally get a title of amateur or college yokozuna. Ichihara: This heavy-weight wrestler (160 kg) is also going to have one more year to enrich his already impressive list of titles. Yamamoto: Huge hope (because of his talent, but also because of his size, similar to the great Hawaiian rikishis). This third year student from Nichidai is eagerly awaited by the double-quintal fans, and is expected to have a great impact in ozumo. Shimoda and Yoshida: Both of them are certainly exceptionally gifted, so now the main question is their hesitation to become professional wrestlers. Neither of them has made his decision for the moment. And the others: Let's quote two other mainstays of Nichidai, the captain, Sakaizawa (whose academic studies are over), and Fukao (2nd year in Nichidai, winner of the world sumo challenge in New York at the age of only 20, and already 180 kg, 1.82 m). Let's add, among the other college wrestlers, Morishita and Tanaka from Tokyo Nogyo, Okuya and Masuda from Kinki, or Ogata from Nihon Taiiku. And we should not forget High School wrestlers, the most promising ones, especially the Japanese-American wrestler from Saitama Sakae Marvin Sano Jr. (1.73 m, 150 kg, and already recruited by Oitekaze beya) and the imposing Lee Dai Won, from Hotoku Gakuen. A big Thank you to Joe Kuroda!